On Saturday 6 April over 130 “time travellers”, fascinated by both waterways and railways, took a unique journey arranged by the Caldon & Uttoxeter Canals Trust on a rarely-open section of the Churnet Valley Railway along the route of the derelict Uttoxeter canal. They travelled to see the initial works undertaken by the Waterway Recovery Group to locate the remains of a 200 year old the canal lock and conserve the adjacent stone railway bridge, and view this beautiful section of remote Churnet Valley landscape in springtime. Works to make a popular stretch of canal towpath more accessible and user-friendly for the local community have now started. The works being carried out by the Canal & River Trust, the charity responsible for the nation’s waterways, will see the Caldon Canal towpath around Cheddleton resurfaced providing walkers, cyclists and disabled visitors with a clean, green traffic-free route. Come along to the Trust’s AGM & Social Evening; the business of the meeting will be followed by refreshments and a “Review of the Year” illustrated presentation. See how you can support the Trust’s work and enjoy an evening with Caldon and Uttoxeter canal friends. The 49th Annual General Meeting of the Caldon & Uttoxeter Canals Trust will take place on Thursday 21 March 2013, at Stoke on Trent Boat Club, Endon Wharf, Post Lane, Endon, ST9 6DT. Works to make a popular stretch of canal towpath more accessible and user-friendly for the local community are set to begin shortly. On Saturday 8 December the Canal & River Trust are inviting you to venture into the Bedford Street lock, walk along the lock bottom and ask our experts about their work. You'll also get the chance to meet the Etruria Boat Group Volunteers, who are bringing along one of their heritage boats. 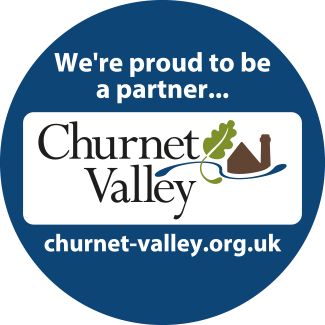 The Trust is delighted to be taking part in the launch of the Canal & River Trust with our Central Shires Waterways partners at Fradley Junction on Thursday 12 July 2012. Find the Caldon Canal on new CRT website by clicking here. We have been advised by British Waterways of works on the Caldon Canal at Cauldon Road Bridge 6, Hanley Park.